Today, I felt like going back to the good ol' days in my kitchen. I decided to make some homemade bread as well as some homemade soup. Based on the Amazing Rosemary Bread recipe by Sea of Green on vegweb.com, I made two huge loaves of bread, minus the rosemary. I doubled the recipe. In place of the water, I used unsweetened almond milk. I thought I should read the instructions on the back of the yeast package and as it turned out, it was a good thing I did. I had been adding it to the liquid first. So now that I've figured out the best way to use rapid-rise yeast (you combine it with some dry ingredients; then add it to the liquids) I think I'm good to go from now on. I was super excited, as the mixture about tripled in size in my ceramic bowl (another change I made--I did not use the stainless steel bowl). When kneading the second time, and when the dough seemed to be getting slightly dry, I dribbled a little olive oil on it. That worked wonders! I had two loaves set out on a cookie sheet in a flash, and they rose almost to high heaven. 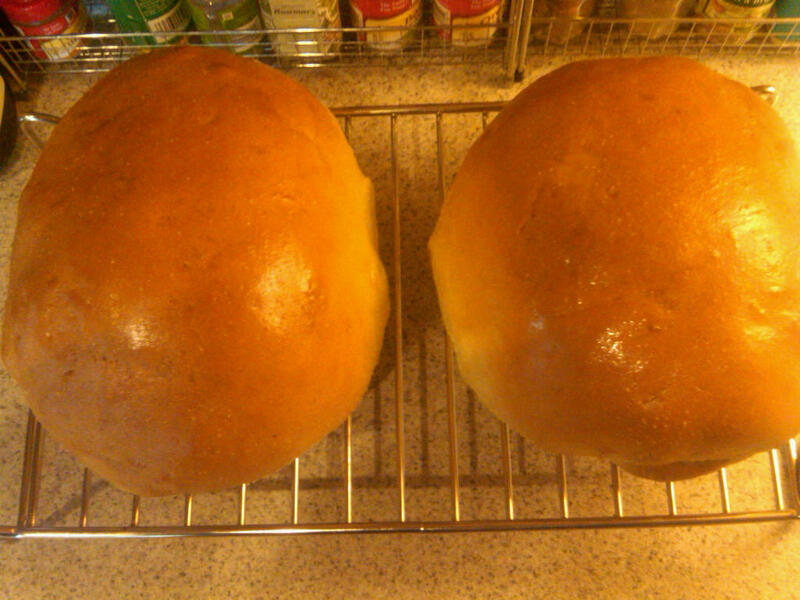 The baking took 50 minutes, but those glorious globs developed into two beauties. I now have a good memorization of how I made this bread, so I'm anxious now to invent some other variations with different seasonings.